This post may contain affiliate links. See disclosure policy for more details. If you are new here, you may want to subscribe to my RSS Feed. Thanks for visiting! So as bloggers we write these awesome posts and we spend hours on them and then what? How do we get people to go back to older posts? 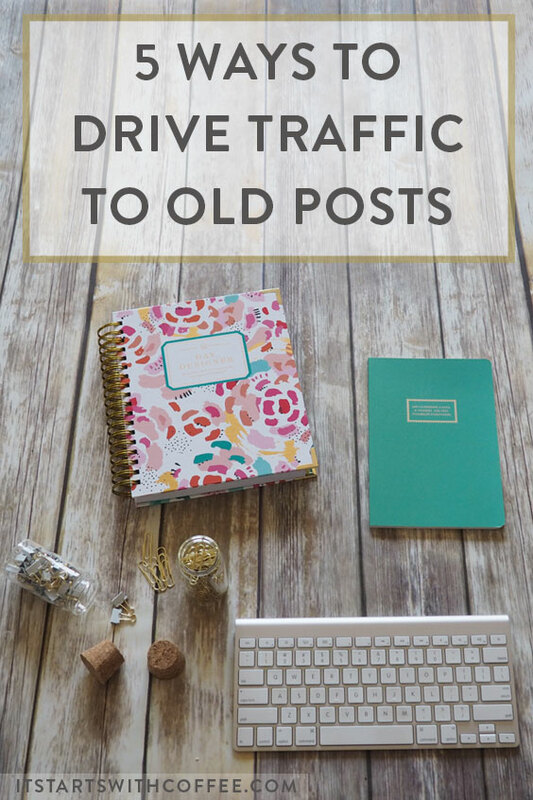 Well today I am telling you 5 ways to drive traffic to old posts! Pinterest: Pinterest is a great way to drive traffic to old posts. I have a post all about how to grow your Pinterest. But I use Tailwind to schedule pins and Boardbooster to loop them. So tons of my older pins are constantly looping which really helps drive traffic to older posts. Share Them On Social: I try to schedule a few random older posts on different social media accounts. I will share a post on my Facebook page or my Twitter account. It’s a great way to get some new eyes on older posts. 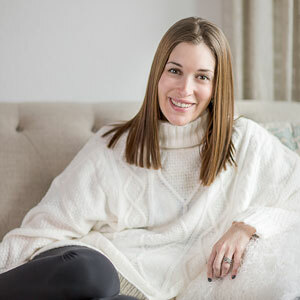 Link Within Posts: Say you are writing a beauty post about your skincare routine and you mention about how you recently bought XYZ an blogged about it. You can link within to that specific post. Just like I did! This way you are constantly linking to older posts. You can also link to entire categories or sections. Have a plugin: There are plugins you can have for popular posts or posts similar to the one someone is reading pop up under your current blog posts. This is a great way to get people to stay on your blog longer and read more posts. Share In Facebook Groups: If you are in Facebook groups for bloggers you can share older posts on the threads on days you may not have a new post. For example if you blog Monday, Wednesday, and Friday share older posts on Tuesdays and Thursdays! Driving traffic to old posts will ONLY help you. It will increase your page views and it will get new eyes on posts! If you enjoyed this post, I would love if you saved/heart it on Bloglovin! I hope you found this helpful! If you enjoyed this post make sure to check out my other blog advice posts! Subscribe + Get My Free Daily Blogging Checklist! I did not know there were plugins to help find popular posts. Cool will have to check that out. Already use and love how boardbooster is growing the pinterest profile so will have to checkout the tailwind tool now too. I never thought about driving content to older posts. I guess I’ve always just focused on my newer content! Great tips! I definitely need to checkout Boardbooster and this ‘looping’ you speak of! And sharing to other blogging groups is such a great way to get eyes on your content…I need to do more of this! Thanks for sharing these tips! I’m big on linking within posts! I try to create ways to refer back to old content whenever possible. I’m not seeing too much traffic yet but it’s a super easy way to make your readers stay connected! I’d love to hear what plugins you recommend for sharing old post! These are such great idea! I’ve had a lot of luck with Pinterest too- such a fabulous tool to get content out there. Definitely it works! I use #tbt or holiday tie-ins to do this as well. Thanks for the tips! Evergreen content is so important ! I love your suggestions! I’ve been meaning to add a “popular posts” or “similar posts” plugin, but I haven’t gotten around to it. I might have to do that this weekend. Great tips! I’ve been trying to do each of these over the last few months and its really helped! The Google gods love internal links. So it’s always a great idea to link to other posts in your blog. Not only for traffic but also for SEO. These are great ideas! What plugin do you use? I am trying to get better about sharing older posts and actually since I’ll be out of town in a few weeks, I thought that would be the perfect opportunity to share some of my older posts to social and not worry about publishing anything new during this time. I need to do a lot more linking within posts. It’s something that I always mean to do, but then I end up forgetting. I use coschedule to bring back life to old posts. These are great tips, I need to share older posts regularly in groups too. Thanks for these tips! I’m curious if you have a tendency to focus on one social media channel or another specifically depending on the type of post or content. Also, do you find Bloglovin helps you with traffic? This is such a great post! It’s so helpful to keep that traffic coming in, even to older posts. Love your suggestions here. Very helpful info! I just recently started thinking about all the older posts that we have. We put out content at least twice a week so it’s easy for posts to become lost in the archives quickly. I love the idea of linking within new posts. I have been wanting to share my old content. It is getting dusty. I have always linked in to old blog posts. That way both new and old get the traffic they need. I haven’t paid attention to my Pinterest in a while. I know it is a gold mine for blog traffic. I will work on that on the weekend. I’ve b been working on this for my blog and these are great tips! I am so using these methods for sure! So many great ideas from this post and from all the comments too! The amount of time it takes to market a blog is overwhelming at times. I have been tackling one challenge at a time, and often wonder how I can possibly add another thing on my to do list. Thankful for everyone here who provides insights and gives me the push to give one more thing a try. Such a huge learning curve at times, but I know it’s worth the effort. Thanks everyone! Thanks for the tips! I link other posts inside new posts as well. Pinterest is definitely a great tool in sharing older posts. One thing that I like to do is go through my old blog posts and make sure that they’re still up-to-date and relevant. If not, I clean them up. Add some content, new images, better formatting, and make sure that all the links are still working. Once it’s freshened up — I republish it and push it out again via social and my newsletter. Sign up to get my Daily Blogging Checklist! It Starts With Coffee © 2019. All Rights Reserved. design + development by white oak creative.